First, don’t be in a hurry to take out all of the crops you had going from fall, winter and spring. 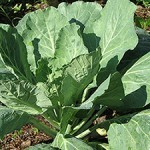 My collard greens always sail right through the summer. 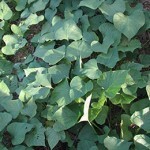 They get tall, and the leaves get heavier, but they are still great eating, and they are a staple in my cooking. Leave the Eggplant in the ground. They do very well through the summer, as will some peppers. Our wild cherry tomatoes will also go quite a ways through the summer before giving up. 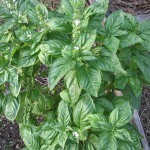 Aphids can become a real problem in the summer garden. Add some rain and you will get caterpillars too. On beans and peas you can get aphids and bean beetles. It’s not a sure thing, but it is best to expect some insect pests. I urge you to plant your crops (summer or winter) with some loss in mind. If spraying the aphids off with water won’t work, you will probably lose the crop to the aphids. If a plant gets hairy with aphids it will not likely recover. Cut the plant down and let it lay there on the garden aphids and all. If you have time to observe you will see how many lizards and bugs come to eat the aphids from the fallen plants. Plant your next crop there, something from a different family. Some of the cut down crop will resurge. If it doesn’t fit well with your next crop cut it down again. The re-surging plants will not likely have aphids, and all of that fallen crop will mulch the soil for the next. Be careful with watering practices. Over watering can over stimulate new growth which is an aphid attractor. I find I have about ten percent more insect pest problems in the summer than I do in the winter. It could be because I grow far fewer types and varieties of plants in the summer. It is harder to avoid mono-cropping. If you decide to grow in the summer try to plant diversely. It will help your garden resist insect infestations. The best time to have planted pineapples was two years ago. The second best time is now. 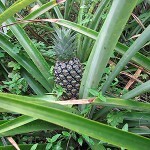 If you get pineapple tops, or the shoots from the pineapple stem it will take those two years of growth before they will fruit. Plants with roots should take just until the next fruiting season (summer time of course!) to fruit. A pineapple plant fruits just once then dies back and leaves several new pups to begin again. There are many tropical fruits that bear in the summer. For a complete and well organized reference book for fruits we can grow here check out Florida’s Best Fruiting Plants by Charles R. Boning. 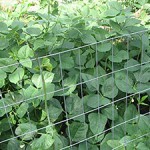 If you decide not to grow edible crops, consider growing some green cover crops. Broadcast a lot of seed so that it comes up thick. Cow peas are a good nitrogen building cover crop. Pearl Millet will also work for a cover crop in the summer, and sweet potato plants cover the soil very well though to harvest them you will end up tilling the soil, and exposing new weed seeds. Working outdoors in the summer can be a challenge, especially if we don’t get our summer rains. If you decide not to grow any vegetable or green mulch crops, cover your beds heavily in organic wastes like leaves, old hay, and manure, wetting the wastes as you put them down. Cover it all over in straw to build great composted soil for the next growing season. We call this sheet composting, and it is the easiest way to assure that you will have enough compost for growing in the following season. If it is not raining at all water your fallow beds once every few weeks. If we should have a hurricane you won’t need to worry about those fallow beds. The straw on top will knit tight, and everything below will stay put. 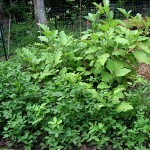 Piling on in this way also discourages weed growth, and those weeds that put themselves into those piles you will find are very easy to remove. Like winter time for northern gardeners is planning time, we can do the same in the summer. If it is just too much for you to be in the garden during the summer spend your summer months cruising seed catalogs, making your fall/winter/spring garden plan and tending and feeding compost piles. Time spent planning will pay off nicely later. Also like northern gardeners in the winter, during the summer we can keep a few jars of seeds sprouting on the counter top in the kitchen to keep ourselves in fresh greens. Some favorite sprouts are wheat, alfalfa, broccoli and mung bean sprouts. Be sure to buy untreated seed meant for sprouting. Have a great summer, and try to stay cool. Very interesting article, and although we are now in our dry season (winter) here in tropical Australia I am also trying to grow year round. One interesting wet season crop here that I was very surprised to find growing is asparagus. Another thing I grow is loofahs and they can be eaten when small – 4-6″ and they taste just like zucchini. We had an extended wet season last year and now we seem to have even more bugs than we did in the wet season. 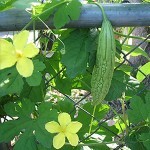 I think I will try bitter gourd next summer. 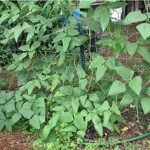 Your vegetable plants look very healthy so far. I decided not to plant much this summer because of the bugs but you’re making me reconsider. 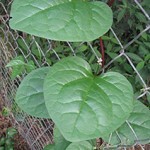 I’ve always wanted to plant the malabar spinach and peanuts. Hhmmm, I think I’ll get off my duff and put something in the ground. Thanks for the info. Excellent Susan, Thanks for your comment. Good luck in your garden this summer. Hey Gillian, Oh yes loofah can be grown here in the summer. How interesting that they taste like zucchini. I think I would like to try that. I do have an asparagus experiment going on here.. The crowns were given to me, two separate times from different sources, and I have had the first of the two going in a pot for about two and a half years. It seems to be getting bigger and more vigorous as time goes on.. I have not harvested any waiting for the plant to multiply. The other younger crowns were put in the ground, and they are still alive, though less vigorous. I think tropical Australia is a lot like South Florida, only in reverse, of course we are in reverse of the rest of our continent growing the summer vegetables in the winter, and then growing tropical vegetables in the summer. As far as for getting information about how to grow food, it isolates us, as what the gardeners on the rest of our continent know doesn’t much help us here.. hence the ManureDepot blog. Thanks very much for your comment, and the loofah suggestion. Thanks for your comment Sara. Perhaps apples would work better for you in Northern Ohio. Apple or Pineapple, both are good. We grew loofah vines up a trellis on the west side of our house last summer and they shaded it so nicely our electric bill was lower :)) However, they died. Are they an annual here due to the frost? By the way, we had a bumper harvest so I have loofah sponges/seeds for any local takers! Hey Gerrie, thanks for your comment. Yes I think your loofah like other gourds is an annual. 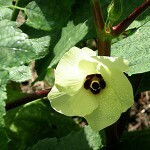 I have just ordered seeds for an open pollinated variety called chinese okra.. I intend to eat them this summer. I remember seeing your loofah vine. It was lovely, loaded with fruit, and a great shady covering for your trellis. I am also growing Taro (dry variety-for roots and leaves), Okinawa Spinach (reduces cholesterol), Katuk, Everglades Tomato, Cassava (yuca), and Moringa (a tree with edible leaves and pods). I am planning a trip to Echo in Ft Meyers with the hope of picking up several more tropical edibles. Thanks for your comment Robert. 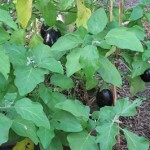 Those are all excellent edible plants that we can grow here in South Florida. I have found that my chickens really like the Moringa leaves. I haven’t been to Echo yet though I have several plants from there thanks to my generous friends.